These paracord shackles / buckles have been designed to fit most paracord bracelet and survival bracelet configurations. PREMIUM QUALITY - Made of Zinc Alloy, durable and sturdy. Great accessory for making paracord survival bracelet.CAN BE USED IN AN EMERGENCY - this clasp can hold up to 1,250 lbs. in an emergency. O-Shackles: Bow Thickness = 0.187", Bow Inner Dianeter = 0.59", Gate Opening = 0.43", Shackle Length = 2.12"
D-Shackles: Bow Thickness = 0.167", Bow Inner Dianeter = 0.39", Gate Opening = 0.39", Shackle Length = 2.16 "
If you have any questions about this product by EDC.1991, contact us by completing and submitting the form below. If you are looking for a specif part number, please include it with your message. 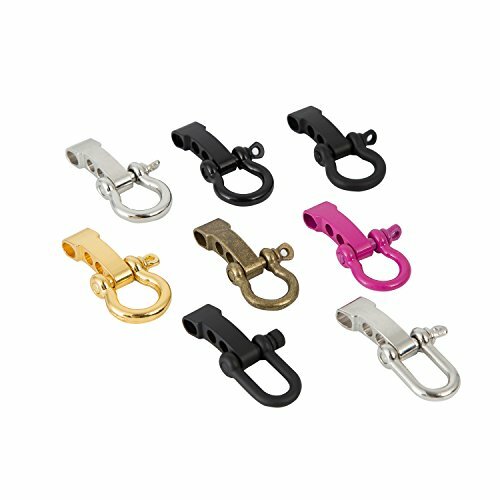 Titan Bow Shackles for Paracord Bracelets (5-Pack) | Premium Stainless Steel Metal Clasps Holds up to 1650 lbs in an Emergency.